HYDE – For the fourth time in a row, the Huntingdon Bearcats battled the Clearfield Bison and came out on top. The Bearcats returned nine letter winners from the previous season, including four seniors. Utilizing four pins, a tech fall and a forfeit, the Bearcats won by five points after splitting the matches 7-7 on the night. The Battling Bison were led by freshman Nolan Barr (3-2), Karson Kline (6-2) and Luke Freeland (4-4). 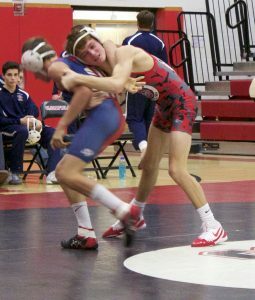 They also received big help from sophomore Nick Domico (5-3) and senior Avry Gisewhite (4-4) who both pinned their opponents to close the match. Nolan Barr opened up the first wrestled match of the night at 113 pounds by giving up a takedown to Bearcat Eric Miley (2-3). He was able to quickly recover after receiving a penalty point from interlocking and reversing Miley to his back. Barr worked a reverse-half nelson for nearly a minute but wasn’t able to get the fall. Starting the second period in neutral, Barr worked a takedown into a half nelson and got his second pin on the season in 2:50. After giving up a forfeit at 106, this made the match 6-6. Karson Kline would then go out and wrestle Huntingdon junior Cayden Reamer (1-4) at 120. After leading 6-0 at the end of the first period, Kline showed his great mat awareness early in the second period by countering a single leg for nearly 30 seconds, utilizing a hard whizzer. Kline would eventually get a takedown to lead 8-0 in the third period where he ran an arm bar for the fall in 4:32. This put Clearfield up 12-6. Then Huntingdon sent out junior Roland Mills (4-3) at 126 pounds, meeting up with junior Bison Peyton Smay (1-5). Though Smay ended up losing the match 11-6, he scored the final takedown of the night and was able to fight off of his back in the second period where he was nearly pinned. In one of the wildest matches of the night, Luke Freeland (4-4) was able to overcome fatigue and a five point deficit to come from behind and get his hand raised over Bearcat Brynen Kisiel (1-3). As a freshman, Freeland found himself battling off his back in the second period from a mean arm bar. Down 6-3 to start the third period, Freeland tried a five point move to put Kisiel on his back but gave up a takedown instead. Then Freeland escaped and went back to work. He was eventually able to use a lateral drop to throw Kisiel to his back and tie the match 8-8. Freeland, clearly exhausted, used all of his energy to hold Kisiel down to enter overtime. Kisiel attempted a poor shot and Freeland spun behind. Before any points were awarded, Kisiel rushed out of bounds and was hit with a penalty point for fleeing the mat, giving Freeland a 9-8 victory. This put Clearfield up 15-9 in the match. After sophomore Justin Hand (2-5) avoided getting pinned at 138, giving up a tech fall to senior Jacob Wagner, senior Jude Pallo made his return to the mat and wrestled Huntingdon’s Briar Deline (3-2). Though Pallo was able to get a takedown from a funk roll early in the first period, he was put on his back in the second and gave up the fall. Team captain Caleb Freeland (7-1) would then wrestle at 152 pounds, taking on senior Draven Zook (1-4). Freeland used three takedowns and a set of back points in the second period to win the match 9-2 and wasn’t able to get any bonus points for the team, and Clearfield trailed 18-20 at this point. The Bearcats then sent out senior Andrew Finkle (1-1) to wrestle freshman Mark McGonigal (6-3). The match was very even. Finkle, who was 14-13 a season ago, used his senior experience as an advantage to get a first period takedown. But in the second period, McGonigal seemed to use his better conditioning to get an escape and a takedown of his own. The third period was scoreless, and McGonigal hung on for a 4-2 victory after he was unable to turn Finkle to his back with an arm bar and half nelson combination he was working. This put Clearfield up 21-20. Then, Clearfield gave up falls at 170 and 182 pounds. Cole Smay (0-4) was pinned by Huntingdon’s Miles Baney (3-2), and Brett Zattoni (0-5) was pinned by Ryder Kocik (4-3). Kocik was fourth at the District 6 AA wrestling championships this past February. Clearfield would respond with falls in two of the last three matches. Sophomore Nick Domico (5-3) had arguably the other wildest match of the night when he met Bearcat junior Gage Peters (2-3) at 195 pounds. Domico scored an initial takedown before giving up a reversal. The Bison would respond in kind with his own reversal to lead 4-2 after the first period. In the second period, Peters chose neutral and immediately headlocked Domico to his back. Domico fought hard for at least a minute until he was finally able to lace his opponents leg and roll out on top for a reversal. As the crowd was cheering his perseverance, Domico locked up a cradle and put Peters on his own back. However, Peters didn’t have the same willingness to fight and was pinned very shortly thereafter. Sophomore Matt Bush wrestled his first career opponent at 220. Isaiah Reed (6-3) proved too strong for Bush and eventually pinned him in the second period. To close the night, senior Bison Avry Gisewhite (4-4) immediately took Lucas Wilson (0-3) to his back and locked up the fall in just 58 seconds with a half nelson. This ended the match in favor of the Huntingdon Bearcats, 38-33. 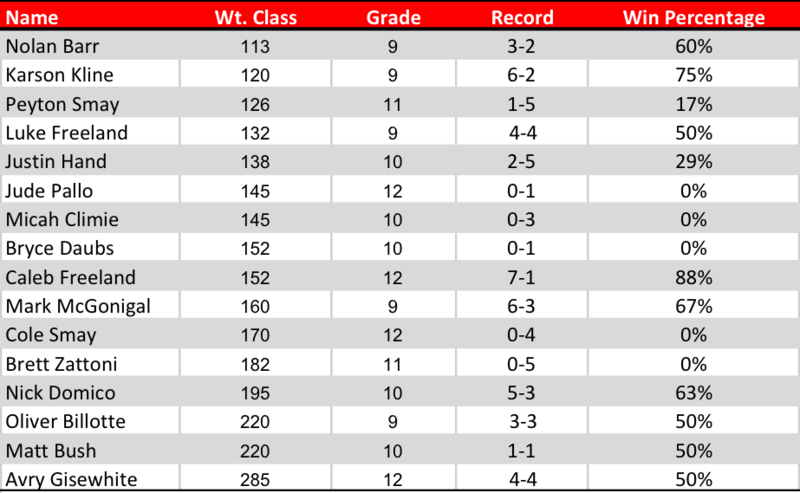 Clearfield (0-3) will now travel to Punxsutawney on Thursday night. The Bison have wrestled three strong opponents in a row, but historically they have been favored over the Chucks.